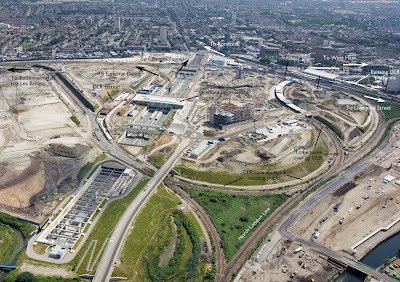 The Olympic Development Authority have published some amazing aerial photos of the Stratford Olympic site, including this one that shows the Stratford International DLR extension very clearly. You can see exactly where the track will go, taking over the North London Line route on the right and then running alongside the existing tracks on the left. They've been quietly boxing in the route at the Stratford station end, in order to build over it. The North London Line will be diverted to use new platforms parallel to the existing main line platforms, using the track along the right hand edge of the picture to get there. This image shows a similar view but from nearer Stratford station. Wow that is a kewl picture! I can actually see my front room on it as well! Any reason why there's a big bridge near platforms 11 & 12 of Stratford station emblazoned "Westfield"? I had to give my colleague some flannel about "a new shopping centre" as an explanation tonight when we passed on the main line. Westfield is the prime developer of Stratford City, a new mixed-use (but principally retail) development for old railway land adjacent to Stratford station. See http://en.wikipedia.org/wiki/Stratford_City for more details. Yep - I think the concrete framework above where it says "Stratford International" is the beginnings of it. Are they also going to box up the lead up to Stratford International Station, or leave it open? kenromford - I think that is just a temporary bridge for site access to the area between P10/11? jon - the lines going up towards the Lea Valley (to the left of the Stratford International box) are going to be covered, NR have sold the 'air rights' above 6m or so, according to the Rail Regulator site.